Most people can remember this. 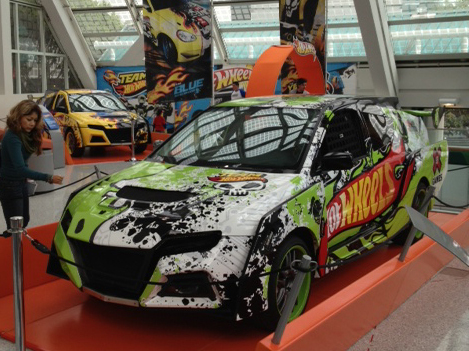 A full life-size Hot Wheels Double Loop Dare! Of course, it wouldn’t be complete without a pair of awesome Hot Wheels cars that were up to the task. Billy Hammon’s team helped to prepare the stunt rigging and the stunt cars to not only make the stunt work, but most importantly keep the drivers safe. Many hours were spent on testing and modifying until everything was absolutely perfect and ready to go. This exciting dare was revealed at the 2012 X Games at the Los Angeles Convention Center. With everyone watching, drivers Greg Tracy in green and Tanner Foust in yellow were anxious and prepared to complete the challenge. It was no surprise that the two famous drivers were successful. A six-story double vertical loop into a 75 ft jump, creating a world record! Hopefully no one will be beating that anytime soon. With special thanks to the Hot Wheels team, below is a documentary to see all the work, preparation and bravery that went into this amazing event.